Francis Ng Chun Yu, Ken Wong Tak Bun, Jennifer Yu Heung Yi and Tony Wu Tsz Tung two nights ago attended their film MEN ON THE DRAGON (YIK LAU DAI SHOOK)'s audience appreciation event. 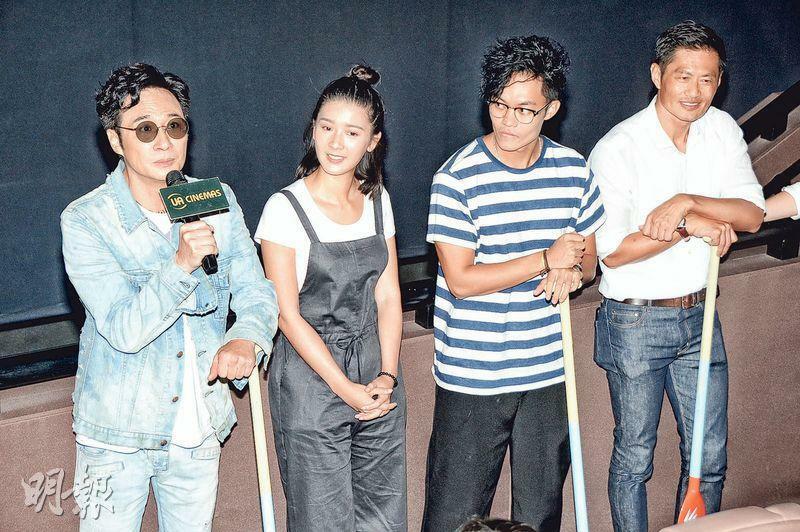 Chun Yu said that the film did not have any shows for its Hong Kong release. A friend wanted to see it after work but could not find a show. He thought it has already left the movies. Chun Yu too thought it was troubling because other films kept opening, but actually MEN has always had 80 to 90% admission rate. Some Mainland viewers even said that this might be the most entertaining Hong Kong film this year. Chun Yu said that many friends asked him for passes but he turned them all down, as he wanted them to get tickets to support the film. "Our movies wasn't made for the market, it also wasn't made to win art awards. It was made with a little meaning, after I made some movies I wouldn't dare to ask people to go and see them. Hong Kong now makes many crime films, a MK (Mongkok) film is very rare. Although it didn't shoot on location in MK, but it used the most MK method!" Chun Yu admitted that he never thought this time would have good word of mouth. They did not spend on advertising so they hoped the cinema circuits would help. He said, "Don't make fun of us for not having Hong Kong films again, if it is imported to the Mainland for a release I believe it would also have certain box office take." Yu Heung Yi said that over days of audience appreciation, Wong Tak Bun was the most popular with viewers. Some female viewers asked for a "love hug". Tak Bun said that he did not mind giving hugs, as long as it would not turn into a bubble bath. As for kisses Yu Heung Yi would be more suitable. Wu Tsz Tung said that he did not know why he was the least popular. Ultimately Tak Bun was the fittest uncle. Tak Bun said that aside from a good physique nothing else was good. The director asked him to play fat and had to make a fake belly for him. Performing and getting into the water in front of a bunch of uncles, Yu Heung Yi admitted that at first she was a little scared but later she too treated herself like a man. Tsz Tung said that they often talked about "guy stuff" in front of her, none of which would be suitable for broadcast. The 55 year old Wong Tak Bun was his 16 year junior girlfriend Joyce Wong secretly registered for marriage. Tak Bun admitted that it was time. He had a ring but did not make any special proposal. He also had no plan for any wedding banquet, only after signing the certificate in Hong Kong he would dine with family. As for children he has not thought about it yet.